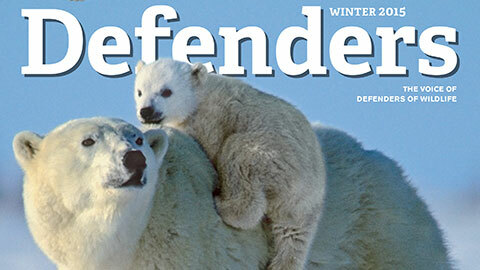 Home | Learn About Wildlife | Defenders Magazine | Fall 2010 | Can We Save Lions? As I write this, I can hear lions roaring near our camp in Duba in the swamps of the Okavango in Botswana. Magical things happen when lions roar in the wild. The first call sets all other living things in the savanna on high alert. As the second and third and fourth lions start up, and the first one roars again, suddenly you can’t tell if it is four lions or ten. It is an eruption of sound like a crowd spontaneously bursting into song. But most of all, it is a call that stitches the fabric of the night together and completes it. Although the situation facing African lions is grave, it is not unique. Many other wild feline and canine species around the world are threatened by habitat loss, poaching, conflict with people and international trade in skins and traditional medicines. Safeguarding these rare animals requires a global commitment. Unfortunately, many countries can’t afford to take action to aid threatened wildlife and need help implementing effective conservation strategies. To address that need, defenders of wildlife, along with other groups such as Panthera, is working to pass legislation that would help protect lions and 14 other foreign species: cheetahs, African wild dogs, dholes, jaguars, Ethiopian wolves, snow leopards, Iberian lynxes, European wolves, clouded leopards, maned wolves, bush dogs, leopards, Darwin’s foxes and Borneo bay cats. The Great Cats and Rare Canids Act would create a $5 million annual fund, administered by the U.S. Fish and Wildlife Service, to aid international efforts to protect these animals. The act would help fund on-the-ground conservation programs such as the Living with Lions project, which transforms lion killers into lion guardians, and the efforts of WildlifeDirect, which is working to address the poisonings of lions in Kenya. The House of Representatives passed this bill in April 2009, and a vote in the Senate is expected this fall. We aren’t unique in our fascination with and sheer admiration of big cats. In just about any major city in the world—from New York to Helsinki, Johannesburg to Nagasaki—you will find statues of lions. They sit majestically, or with a foot up on a ball, or snarl like menacing beasts, or crouch, or run, or strike some other suitable pose. We humans seem to have admired them and feared them and worshipped their nobility and strength for thousands of years. And we have killed them mercilessly. Since Beverly and I were born, lion numbers have dropped from an already reduced 450,000 down to just 20,000 and possibly even lower today. People have shot, speared, trapped and poisoned lions relentlessly. We have chopped up their habitat, introduced diseases and, lately, we’ve begun to change the climate they—and the rest of us—live in. Most of all, we are swamping them by our sheer numbers. The 20,000 lions cling to the last remaining habitat our 7 billion people have not yet got to. I strongly believe that unless we recognize this as an emergency and take action now, we will witness the extinction of wild lions—these iconic predators that once ruled from the southern tip of Africa all the way to northwestern India—by 2020. Extinction by 2020. What would that mean? Besides the loss of the magic and romance of these majestic animals, and our spiritual connection with them, there would be a cascade of ecological impacts. The first of these would be an increase in some of the lion’s prey, such as wildebeest and buffalo, which would also become less alert and less active in the absence of a fearsome predator. These larger, more stagnant populations of herbivores could overgraze their habitat, leading to soil erosion that in turn causes poor water quality downstream and aids the invasion of weeds and exotic plant species. Finally the bloated populations of prey could collapse as the degraded habitat can no longer support them. There would be economic and social costs to people, too. In Ghana, for example, when fish stocks declined and men turned to meat poaching to feed their families, they wiped out the competition for game—lions—and started chipping away at wildlife populations. As a result of the disappearance of predators, baboons got bolder and their numbers exploded. In turn, these bolder and more numerous baboons started raiding crop farms and attacking farmers. Worldwide, the ecotourism industry generates about $200 billion a year—an estimated $80 billion of which ends up in Africa. Most African tourism is safari tourism. Research indicates that if big cats were no longer featured on that dream safari, far fewer people would come to Africa. Without the $80 billion annual revenue stream communities (and some governments) would start failing and poverty would increase. In addition to the problem of those that don’t appreciate lions enough, there is the challenge of those who appreciate this big cat too much. One example of the latter is trophy hunting. I am not anti-hunting. With just 20,000 lions left, however, targeting one of the last 4,500 male lions on Earth with a high-powered rifle merely to serve the pleasure of ego, sport and power, seems inappropriate right now. Each year an average of about 500 lion trophies or skins enter the United States from trophy hunting in Africa. If you do the math, you quickly see that this is not sustainable. Because male lions operate in coalitions of two or three, each male lion that is shot leaves the remaining male outmatched in the next territorial fight, and he is expelled. There is no future for expelled lions, so one license effectively kills two males. At the same time his eight females (on average) and their 24 cubs are left without defenders. The new alpha males are genetically wired to kill all cubs and start the breeding process again with their genes. So one license is really cleaning out between 20 and 30 lions each time—and if Americans are responsible for 500 of those licenses, they are effectively killing lions at an enormous rate. If I had to choose I’d say the biggest threat to lions is the burgeoning human population. I tracked the curve of lion populations during the past 50 years and then compared it to the human population curve. The result: Every time we add a billion people to our roster we cut their populations in half. We are in essence squeezing big cats out of existence. With the human population explosion there is an associated cattle explosion. In Africa, cattle culture communities—especially in areas suffering from climate-change-induced drought—are grazing domestic stock farther and farther into wildlife reserves than ever. Cattle are different than indigenous grazing animals—especially in the numbers now being raised by herders. They rip out the grass and chop up sensitive ground in a way that wildebeest and zebras do not. The cattle stay in certain areas and do more damage every day while wildebeest charge through millions of acres of habitat on their well-refined migratory circuits. But once again, it’s humans that do more damage. Cattle cultures up and down Africa are in daily conflict with predators, for understandable reasons; lions eat their livelihood. Those who wish to do harm to lions have at their disposal a granular poison known as carbofuran, the most popular of which goes under the trade name of Furadan. This substance, developed by an American company as a crop pesticide, is so toxic that it is banned in the United States and the European Union—but it is widely available in East Africa. A quarter teaspoon kills a lion (and a human) in minutes. A handful sprinkled on an animal carcass wipes out a whole pride that feeds on the carcass, the hyenas that come in afterwards, the vultures and jackals and any insects that settle there. It is a “dirty bomb” against wildlife and the natural world and rapidly becoming the poachers’ weapon of choice. When we and other conservationists engaged with the manufacturers, they started buying it back in Kenya. The buyback program is too slow, however, and this potent chemical is still being used, and spreading west and south like an epidemic. Tragically, a young Kenyan boy ate some late last year and dropped dead. In another recent incident, workers at a lodge in Maasai Mara National Park sprinkled some on their vegetable gardens, killing a hippo that night, and lions and vultures that came to feed on the hippo the next day. Another sinister activity that threatens lions (and other big cats) is the trade in their body parts for traditional medicines. There is a burgeoning bone market in Asia for medicines in the ground-up form, or as tea, soup and wine. Drinking tiger or lion bone wine is thought to enhance sexual prowess. It is largely tiger bones that satisfy this need now, but there is no perceivable difference between tiger and lion bone, so lions are being poached for Eastern medicine now as well. In South Africa recently, the authorities in one province issued permits for a farmer who was previously in the “canned lions” hunting business (a practice where lions are bred and raised in small enclosures and then shot in a ‘safari hunt’) to now kill 44 of his lions and turn them into bones. These bones will be legally sanctioned and exported to the East. Now, thanks to this action, anyone with illegal tiger bones can claim they are legal lion bones from South Africa. After nearly three decades of witnessing these problems and actively promoting the saving of big cats via our films and books, Beverly and I decided that inspiring people is just not enough—we had to roll up our sleeves and get involved directly in conservation. So, in 2008 we set up a foundation with the National Geographic Society called the Big Cats Initiative. The goal of the Big Cats Initiative is to halt the decline in lion numbers by 2015 and gradually restore populations to sustainable levels—at least double present levels. A major component of this effort is educating local communities about how to protect themselves against lion attacks. We’ve produced films in Ma and Swahili to help. We’re finding ways to help communities see economic benefits from lions and other big cats—through ecotourism, for example. And we are helping people avoid economic losses by paying compensation to cattle owners if their livestock is killed by one of ‘our’ lions. We offer compensation for their lost cattle at fair market value—but only if there are no lions killed by Maasai warriors and hunters during that quarter. We and Defenders of Wildlife support an excellent program in Kenya called Living with Lions, where Maasai warriors are trained to track and follow lions and warn herders when they approach. These lion guardians protect lions but by so doing they protect cattle and reduce conflict. We’re spending some time developing devices that can electronically and automatically alert herders to the presence of lions, and deter the big cats from raiding livestock. We’re also supporting a Living Boma project that develops enclosures for cattle out of fast-growing but tough trees. It protects cattle from lions, and also negates the constant need to collect wood to fortify enclosures. We are also getting behind saving one lion at a time, realizing that we need to be careful we don’t abandon genetically isolated populations. Recently we looked at a small lion population in Wasa National Park in Cameroon. Wasa park may have only a handful of lions, but new genetic evidence shows that many of these populations are unique. As always, it’s a lot cheaper to protect species than reintroduce them later when they are locally extinct. But Beverly and I aren’t able to talk to every community in lion country, nor can we change every ecosystem. The solutions to this problem will not come from one team, or work in all countries. What we need is a collaboration of everyone who is interested in lion conservation: scientists, communities, churches, conservation groups such as Defenders of Wildlife, hunters and anyone else who understands that if we don’t take action, we could wipe out lions and make the planet a poorer place for it. To sit and listen to a lion roar in the African bush is to sit on the edge of paradise, a wilderness that is both rare and essential. Without lions and other big cats, the world will increasingly become a place filled with clutter and noise. And the noble statues of lions that grace our cities will stand silently as reminders of the fork in the road we could have taken. Dereck Joubert and his wife, Beverly, are award-winning filmmakers from Botswana. They have been documenting and researching the African environment for nearly three decades, resulting in 20 films, six books and many articles for National Geographic and other publications.